The consultation, which will be held in November under ‘The People’s Project’ campaign name, marks the start of a formal process which will lead to the submission of planning applications for both sites in the second half of 2019. The public consultation, which launches on Thursday 15 November and will last three weeks, will ask members of the public for their views on Bramley-Moore Dock as the proposed site for the new stadium. It will also seek views on the Club’s intention to leave a legacy at Goodison Park. “We have deep roots in Liverpool 4 and are committed to building on the extensive investment we have already made in the area. We are preparing plans to redevelop the existing stadium site to create facilities which will benefit the whole community, creating jobs and improving lives. 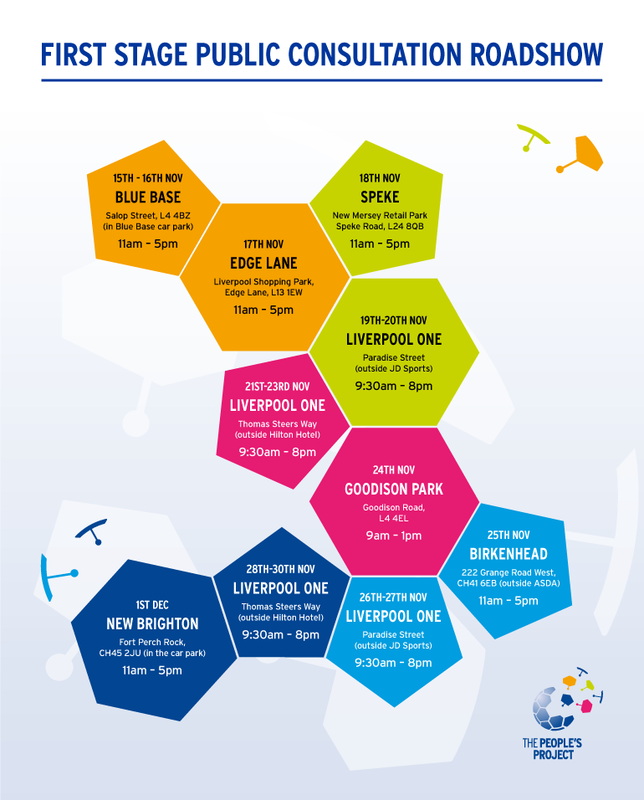 The public consultation will see an exhibition about the proposals visit a range of locations in the Liverpool City Region, including Liverpool ONE, retail parks in Speke and Edge Lane as well as Birkenhead and New Brighton in Wirral. There will also be a fixed exhibition at The Blue Base on Salop Street near Goodison Park for residents living in Liverpool 4. A second public consultation will be held in the summer of 2019, at which point the Club will present the proposed design of the stadium and further details on its Goodison Park legacy plans. For residents living in Liverpool 4 a consultation leading on the Club’s intention to leave a sustainable legacy at Goodison Park is open at The Blue Base from Monday to Friday for two weeks.